While I had hopes for more melt over the last few days, I did hear dripping all night, and the piles are getting lower (and looking dirtier in the process) so I know it is happening. The bug man is coming this morning – quarterly visit to keep us spider free, so I need to get dressed and going earlier than I would otherwise, but that is good. Laundry and the PO of course, as I do each week. I need to start making my thank you notes for the tax volunteers – not sure what I will make for them this year, but it is time to come up with something. I made the earrings for Mom (well, that she ordered, she won’t wear them) and while they aren’t my favorite colors, they came out well. Only thing is, they came out backwards on the earring wire! I’ll open it today and flip them around, then get photos and share. It’s a puttering day! My favorite kind. Today is not one of my normal tax days, but I was called to help out at the Bangor Public Library today, so I got my act together, (thankfully) packed up the knitting, and headed to the big city, where we actually have to PAY TO PARK! The server went down as I was finishing up my first client, they will give us an update at 1. Hopefully, it will be to say they are back online. So, I sit with my knitting and gaze at the periodical covers, wondering why they don’t have any knitting magazines. I read the craft and bead ones, there is a crochet one I will look at this afternoon if the system doesn’t come up. This is a lovely reading room, I never got to enjoy it before. They asked me to come up the next three Wednesdays to help out, I said I would. I hope this doesn’t happen each time. I could sit at home and knit and look at magazines. 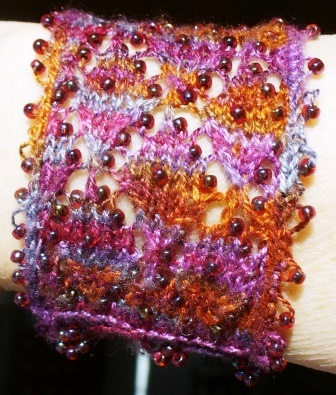 I finished blocking the beaded lace cuff, and have the photos to show for it! A link to my project page is here. And here are a couple of shots of it on my wrist. It is a bit big, stretched during blocking. I think I can block it again and make it a bit smaller. Here’s a shot of the clasp – buttons made with beads. they feel a bit tenuous to me, come undone quite easily, so I likely will replace them with larger beads or buttons, and next time I make this, I will use a traditional clasp or larger buttons. the pattern calls for two, I made three to cover the whole width of the cuff, but if I use larger buttons, I will go back to two as called for. 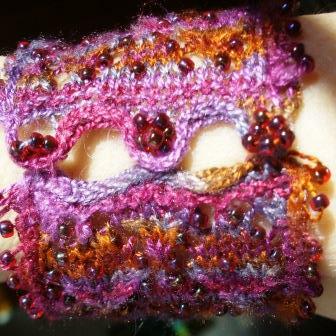 On the whole, I am quite happy with this pattern, as I usually am with Laura Nelkin’s things. 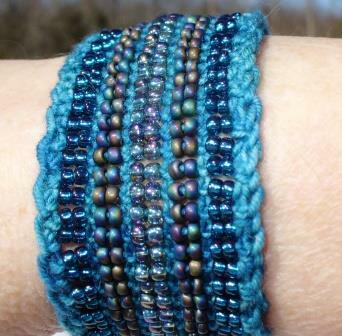 the applied beaded I-cord around all edges is fussy to do (especially with silk on size 1 needles), but it is the perfect finishing touch to this project. I’ll be making more of these. Which you might not be able to tell by the howling wind and snow, but you can certainly tell by the number of basketball games we have watched! So I have been knitting a lot, too. 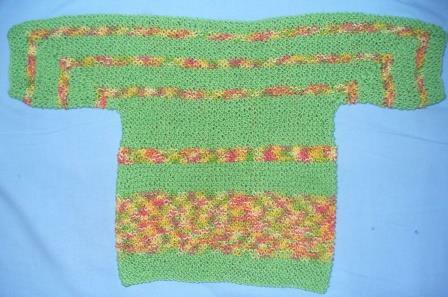 I knit a baby sweater this week, while still moving forward on other projects. This was an experiment – a Baby Surprise Jacket by Elizabeth Zimmerman, I was thinking of doing an adult sized one with sock scraps, over years, actually, as I am almost out of sock scraps, and don’t really need socks right now… but the instructions and blogs and Ravelry and clerk in the yarn store all said to make a baby one first, so I did. I have a surprisingly large quantity of some cotton, so I made it out of that, and think it would be just the thing for a babe fresh from bath or swimming – the cotton fabric is very soft and drapes nicely. 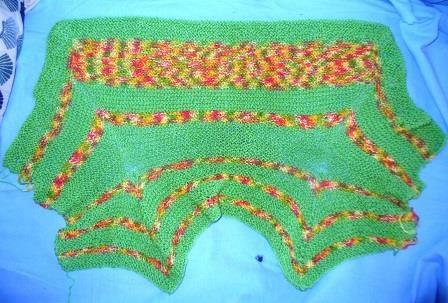 With cotton and garter stitch, this will stretch and grow with the baby. I just need to locate the right buttons and it will be complete. Then I guess it will go on Etsy as I know no babies. 🙂 And the adult version in sock yarn may never happen. I realize that such a beast would require an inordinate number of stitcheds per row. Not sure if I want to face that! But I know how, and that it will work. 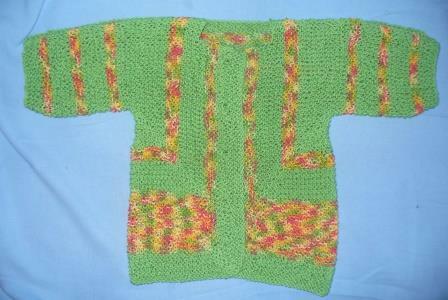 Pretty amazing that you knit it all in one piece, fold, and stitch shoulder seams to get a sweater! All knit, just needs end woven in and folding. The stripes on the back are quite different, which I find intriguing. Can’t you just see it in a million stripes of sock yarn?? It grows to the full width from a narrower band, which you can see a hint of in the first photo. I tried to lay it out on the floor to get a picture of the whole, but my inspectors decided that wasn’t a good idea. They were there within seconds of me putting the bracelet on the floor. Not sure what the attraction was, but there was no getting a clear shot. Of course, it is still close to zero at night, and we have snow coming this weekend, but what the heck, let’s celebrate with an American rite of spring – income tax! That’s right, that’s what I will be doing all day, this time up in Bangor. So no time for fun lists today. 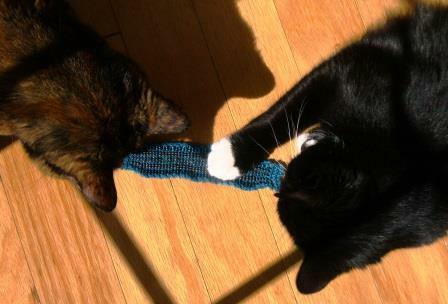 I’ll carry the knitting and hope for a break to work on it. And I’ll try to do something fun or interesting this weekend to make up or it. Author salpal1Posted on March 20, 2015 March 19, 2015 Categories how I plan to spend my dayTags Friday, spring, taxes, to-do list4 Comments on SPRING! When I was a little kid, in the grades, I never, ever wore green, but most especially never, ever on March 17th. My mother came from a family with a strong Scots/English heritage, and she always put an orange ribbon in my hair for school this day. I didn’t really understand it all then, but I knew one thing – I was the only kid in the class who wasn’t Irish and proud of it on March 17th. Then, when I was a teen, my dad married an Irish-American woman who was rightly proud of her family’s heritage. Suddenly, there was no talk of me owning anything orange on March 17th! I had better get some green hair ribbons. For many years, I wore green AND orange hair ribbons on St Paddy’s Day. Truthfully? I don’t look good in green OR orange. So, just to keep the peace and me looking my best, today I am wearing pink. I think pink looks nice with green and orange. But not both at once. Somehow in my mind I thought when I “just” am doing taxes for work I would have tons of free time and ambition. Turns out, not so much of either. Our region lost several seasoned volunteers this year, and while we picked up some great new ones, new ones are not in a position to replace seasoned ones. It takes time to learn all the tricks of tax prep. So, I have been helping out at different sites around the map, and that has meant not so many free days. I have endless big project lists, but what I really want to do is sit on the couch and knit, and I have done a lot of that. Today is technically a free day, although I do have a remote site review with the IRS on the phone today. That’s where they call and run through a list of questions to make sure we are following the rules. It’s in place of the old random site visits where they came to see if we were doing everything right. But since 1.) they have no travel money and 2.) the nearest IRS person is over 2 hours away, we haven’t seen them in a few years. I guess they think that remote reviews are better than none. I am not too sure they are effective, unless someone doesn’t know what they are supposed to be doing? Anyway, I have already had one of these this year for one of my sites, so I am not too worried about this one. More of an annoyance than anything else, on what should be a free day! This morning I am washing the comforter cover – a not unusual thing, but it is for an unusual reason. This morning, I got up early with A, and while she showered, I went and got a cup of coffee, then climbed back into bed. I have a huge pile of pillows right now, because I have a cold, and it is easier to sleep propped up. So, I snuggled into my pillows with coffee in hand, and the pillows started wriggling under me. Coffee, of course spilled as I sat up, quite startled. Not, though, as startled as Zumba was to first get squished in her soft hidey hole, and then, as she bolted from it, to have coffee dumped on her. Luckily I use a lot of cream, so it wasn’t hot. It was not the quiet relaxing start to the day either of us anticipated! And a quick grocery trip for odds and ends. Then home, where I hope to make a few cards for Etsy. I sold both of the ones I made last week – and so want to put a few more up to take their place. It is likely that I will work on the sleeves to the baby sweater which are moving along nicely, the blue linen stitch scarf – which, although feeling endless, does show some modest results from my forcing myself to work on it some each day (thank you Knitting Sarah for teaching this to me!) and I might knit up the earrings that are the reason I went to the bead store last week. They don’t take too long to do. Oh, a PS for you birders. This newbie identified a new bird at the feeder this week – the white-breasted nuthatch. As I have not seen him before, I have to assume that we are getting new birds around now – almost like it is spring?